CallEngine is proud to announce that we have attained the status of Google Premier Partner. 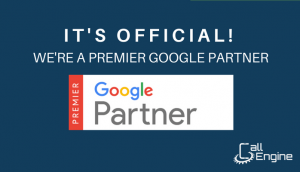 Becoming a Google Premier Partner is a prestigious accomplishment that is earned by top performers in the industry that meet certain requirements. For years, CallEngine has taken pride in mastering the art of paid search advertising to help companies thrive across various verticals. As one of the most experienced teams in the industry, the key to success has always been to ensure the happiness of our clients. We do this by keeping up to date with new trends and advancements in the online marketing space, so that we are able to perform to the highest standard. Premier Google Partner status certifies CallEngine as a reliable and proficient search marketing company. Google requires all Premier Partners to have a consistently growing customer base, fulfill a higher spend requirement and employ Certified Google AdWords specialists with advanced AdWords knowledge. To achieve such recognition, CallEngine has proven itself by managing numerous client accounts with substantial advertising budgets, building long term relationships with these clients, and ensuring consistent revenue growth. For the CallEngine team, with experience also comes passion. Our growing team of Google AdWords Certified professionals are constantly developing strategies to go above and beyond objectives set by clients. Advanced Google AdWords Proficiency: CallEngine’s marketing specialists are certified in Google AdWords, and can provide the knowledge and expertise necessary to help your business thrive. Our team can assist in everything from setting up an AdWords campaign, to determining a strategy, and even fully managing your campaign. Quality Control: CallEngine leverages its internal team to generate new sales prospects for its clients. We ensure that our clients understand how leads are being generated so that they can have the peace of mind that they deserve. Transparent Reporting and Support: Understanding the success of your campaign is critical for making improvements. With CallEngine, clients can access campaign details in real-time. Our team is not only constantly looking to optimize campaigns based on data, but we are also here to answer all of your questions. Our goal at CallEngine is to help businesses increase revenue and continuously grow through search marketing efforts. With the right tools, expertise and support, our team is able to exceed client expectations.